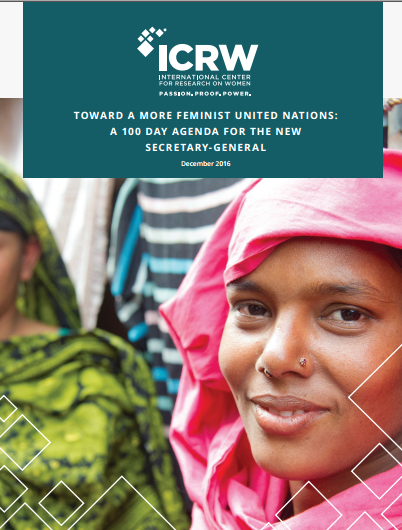 The International Center for Research on Women (ICRW) published recommendations for the new U.N. Secretary-General Guterres on how to achieve a vision for a more feminist UN as well as both transformative and practical steps that can be taken by a number of actors. WEDO’s Co-Director Bridget Burns contributed to the paper, along with Sarah Gammage, Lyric Thompson and Rachel Clement of ICRW and leading, feminist thinkers in civil society, philanthropy, academia, as well as current and former UN staff. The incoming Secretary-General should signal a willingness to take on these issues head on by setting out a feminist agenda for the first hundred days that acknowledges the challenges inherent in the system and articulates a pathway forward. This report lays out the top six things Secretary-General Guterres should do in order to create an agenda that truly puts gender equality at the forefront of the United Nations. To read the 100 Day Agenda, please download here.